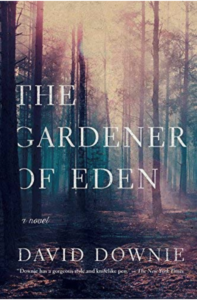 If you squint just a bit when you look toward the future, you can see the dystopian world David Downie conjures in The Gardener of Eden, his second novel and umpteenth book, counting his food work and his immersive deconstructions of Paris and the French. The troubles that drove JP Adams from the upper reaches of the legal establishment to an RV in the parking lot next to an old motel, now reinvented as a resort, are the backdrop to the story. JP and his parents lived in the Eden forty years before, when his father was starting a new job running the fish hatchery, so that’s where JP chose to land first, but the town isn’t what it was when he went East to college. As he takes his daily walk on the beach below the bluff, a tree falls on the roof of his RV. The sheriff’s surveillance camera sees it, and a suspicious and hostile deputy appears before JP returns. It foreshadows what is to come, and gives us a first look at the pervasive surveillance he will find. Anyone who has lived in a small town may have seen Carverville, Downie’s fictional Cannery Row, which is now an economic desert whose salmon fishery and lumber industries were sacrificed to clearcutting and environmental plunder. The cannery is now a mini-mall. The strutting, obese sheriff is obsessed with keeping the town cleansed of drug addicts, marijuana growers and itinerants of all sorts. His fixation almost gets JP in serious trouble until the sheriff learns they were high school classmates, but that history only brings trouble of a different kind, rooted in memories that seemed important in high school but should have faded into distant memory long ago. The characters sparkle. JP, the establishment lawyer besieged by the new crypto-fascist government and driven out of his career; Maggie, the high-school girlfriend he came back to find, not knowing if she were still there but not realizing, either, that he was looking for her until he could think of nothing else; and the memorable Beverly, the Sherlock Holmes fan and talented cook running the Eden Resort, which she and the last of her three husbands bought. During the forty years between their times, dark things went on at the Eden. On the surface, Carverville was much like Joe Arpaio’s Arizona, including the immigrant inmates forced to wear pink underwear. But it was the Eden, its crumbling old pier on the Pacific, the pile of rusting cages on its lawn, and its menacing feral hogs that bring the true horror of Carverville into focus. Northern California is Downie’s native land, although he now lives in Paris with his wife, the eminent photographer Alison Harris, and writes with equal facility about the food, wine and history of France and Italy, where he also lived. Pegasus Books Ltd., New York, March 5, 2019 . Available for pre-order.